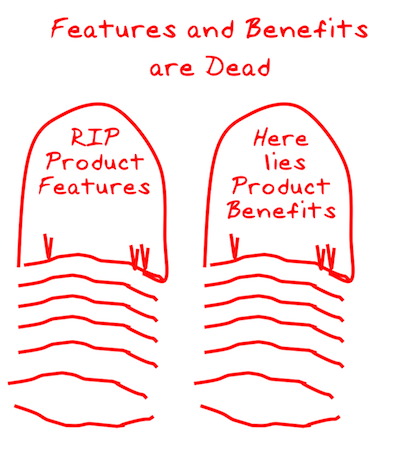 Features and Benefits - Are Dead! Product marketing and product training is built on a foundation of boring PowerPoint presentations that describe product in terms of features and benefits. For a product feature to be of benefit to a user, the user must firstly have the problem or sub-optimal condition that the product feature addresses and have a pressing need to resolve it. It is impossible to know if a product feature will be of benefit without first understanding the client condition. Today the role of Product Marketing is to work with sales to create a core value proposition that sales can use immediately - without translation, and that buyers can easily understand. B2B buyers are not interested in features...they are interested in relevant and useful capabilities that can be applied to resolve the underlying causes of their problems. The fastest way to get your sales team to position your products/services around relevant capabilities and engage and qualify buyers is through conversation... not product presentations. Asking insightful questions, sharing a point of view and telling stories that help customers see how their current situation and perspective is unsafe is step-1. Only then will the customer be interested in changing their perspective and the value of a future state. If you guide the customer through this process, then you have created value and through this lens, the customer will see you differently. Bob Schmonsees Problem-Cause Value model was a revelation to me when I saw it and have been using it ever since. Once capabilities have been mapped to the causes of buyers problems, competitive differentiation becomes a much simpler task. Find out how to create structured content and stories that salespeople will remember and use.